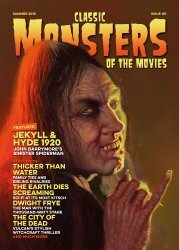 Direct to MyMovieMonsters.com from the United Kingdom: The 12th issue of Classic Monsters of the Movies magazine -- continuing the tradition of the great monster mags of yore! 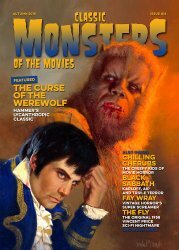 Classic Monsters of the Movies #12 features beautiful new cover art by Daniel Horne of Oliver Reed from Curse of the Werewolf. The Curse of the Werewolf -- Hammer's journey into the werewolf genre stands alone in so many ways. Oliver Reed dominates the screen, but has tough competition in a movie so full of excellent detail, sympathetic characters and a unique atmosphere. Chilling Cherubs -- the little treasures can be little terrors too. Whether they're putting other people in danger, being victimised themselves, or turning out to be the spawn of pure evil, kids have a lot to answer for in classic horror movies. Black Sabbath -- Mario Bava's anthology horror thriller makes for intriguing viewing, with a range of stories offering a wealth of creeps and shocks. Horror historian Bruce G Hallenbeck looks this haunting entry into the annals of moviedom. Fay Wray -- as hapless Ann Darrow she stole our hearts, but her life was spent doing far more than screaming at giant apes. Our biography explores the life of a true horror superstar. The Fly -- Al Edison mutates, Patricia Owens panics and Vincent Price does everything he does best in this 1958 body horror classic. We put the bug spray down and have a look around the garden to uncover the story of this beloved movie. Dr Renault's Secret -- J Carrol Naish brings his gift for characterisation to a movie that's sometimes terrifying, sometimes poignant, but always memorable. Karl Freund -- our Star Spotlight feature shows us why we owe this talented moviemaker an enormous debt of gratitude. On the big and small screens alike, he brought about real and lasting change. The Ghost Train -- all aboard for laughs and chills as we join Arthur Askey on the desolate station platform. There's a train approaching, but is it the kind you really want to board? Find out in our Kitsch Corner profile of this spooky mystery. -- And so much more! Packed with stills, posters, articles and info. Printed and finished to the highest standard. Collectors Note: Brand-new and uncirculated. Missed Classic Monsters #11? Use the handy Buy Both button below to order!